Musicals in London – a real treat! Have you ever gone to the theatre wondering where it is: is there a tube station nearby, a restaurant, a pub or even a hotel? Here is a list of London Musicals – still on and opening soon. Also listed is a nearby hotel or two and the closest tube station if you need to travel. Also a few bars and restaurants for that post show drink or pre-theatre dinner. No inciteful comment I’m afraid – that’s elsewhere – just a list: I hope this is of use! 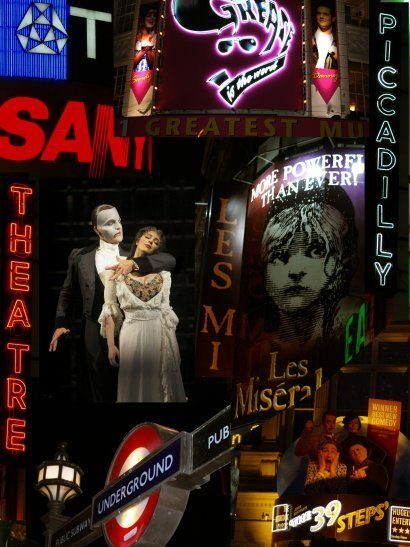 You can even book your London musical Theatre Break here! One of Britain’s most successful films comes to Theatre Breaks, with the story of the young Northern boy who is determined to dance at the Royal Ballet School – despite all the doubters. With award winning music by Elton John. Tube: Victoria on the Victoria (light blue), Circle (yellow) and district (green) lines. Anything Else? : YES! Buckingham Palace! Anything Else? : More restaurants and bars and theatres than you can shake a stick at! Jersey Boys Theatre Breaks, The Story of Frankie Valli and The Four Seasons is playing at the Prince Edward Theatre, London. Discover the rags-to-rock-to riches tale of four boys working their way from the streets of New Jersey to the heights on international pop-stardom. Whether you’re revisiting an old favourite or enjoying this great story afresh, Les Miserables is a truly epic Theatre Break spectacle. A powerful story gently told, of one man and the effect he has on a host of vivid characters as 19th century France plunges toward revolution. The Theatre Breaks musical, based around the songs of 80s super group Abba, about a lass who’s getting married on a Greek Island and her search for her real dad – Super Duper. In 1987 on the Sunset Strip, a small town girl meets a big city rocker in LA’s most famous rock club and they fell in love to the greatest songs of the 80s. Disney’s magnificent stage adaptation of The Lion King Theatre Break features inspired puppetry and technical wizardry, brought to life by a cast of over 40 actors, singers and dancers. A spectacular visual feast, The Lion King transports audiences to a dazzling world that explodes with glorious colours, stunning effects and enchanting music. The Theatre Breaks story of the haunted stage of the Paris Opera. When an unknown is tutored to become the leading lady by a mysterious masked man, there are bound to be fireworks. Thriller – Live is a spectacular, high-octane show specially created to celebrate the career of the world’s greatest entertainer and undisputed King of Pop – Michael Jackson. Moonwalking into the West End after three acclaimed UK tours and standing ovations across Germany, Holland and Scandanavia, Thriller – Live pays tribute to the musical hits and career of Michael Jackson and The Jackson 5. A We Will Rock You Theatre Break features 31 of Queen’s greatest songs. Set on Earth in the future, all music instruments are banned. But there is growing resistance from the rebel Bohemians! An underground movement of music lovers is looking for a leader to take them out of the subway and into the real world of rock ‘n’ roll: enter Galileo.